It’s been another couple of weeks, and a lot has happened in Rufus’ exciting life. He remained unimpressed with the eclipse, essentially telling me we have to travel to the next Path of Totality in seven years. We’ll do our best. As for the Path of Totality, I appreciate that this phrase now has a positive meaning rather than the list of items destroyed by my canine friend. Since returning back to the house after my week in Breckinridge, and his week at Dog-Topia, we fostered a puppy for a few days. All Points West GSP needed a temporary foster, initially for a night but that extended to more. I volunteered my home thinking this sounded pretty fun. 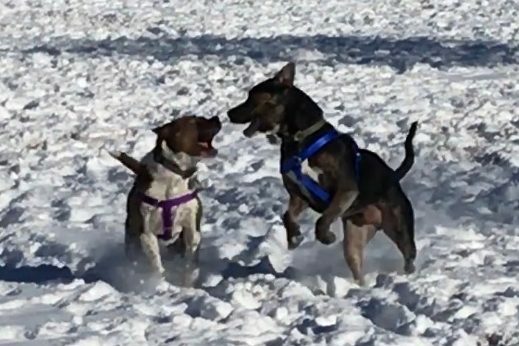 I explained who my other two dogs were: a 6-year-old, fifty pound (ish) pit mix, and a seventy pound Boxer/Rotty mix who enjoys wrestling with anyone. That was it. I did not know what other boundaries needed to be set. Jay, the dog, was a 10-month-old GSP mix arriving in town via Hope for Paws in their swanky new transport vehicle. Apparently it’s got AC and piped in music: the works. Jay arrived from Kansas on a Thursday evening, and the wonderful Sheila waited for him to deliver him to me. She showed up with the very, very, very large dog. The first thing I said was, “He’s humongous!” Possibly a Great Dane cross? Who knows? We set up the crate immediately – very easy to do with two people – and brought him in. Rufus, for his part, had a conniption fit in his crate. He could not stand another dog exploring his back yard and playing with his best friend. Sophie thought Jay was great. They played and wrestled a bit. The thing about Jay was that he was still in-tact. He did not display aggression in the slightest, but my concern remained Rufus: he’s nutless, but would he smell the raging testosterone? (Does testosterone rage?) Would he feel the need to prove how tough he was? He’s got the mentality of a doofus eighth-grade boy so that stayed a possibility. Sheila and I decided to let Rufus out to meet Jay. Rufus tore out of his crate and the boys began sniffing. Things went well until Rufus began full-throttle-Rufusing. No fighting, no territoriality, just lots of PLAY WITH ME! Jay, very understandably, got scared. Rufus had to act like a jerk and could not contain himself. Jay did not lash out. In fact, when Rufus finally did calm down, the two boys got along very well. Rufus’ problem is that he does not calm the f**k down when at play. Sophie can set boundaries with him, and that seems to be it. A puppy is not going to be able to do this. While my dogs stayed in the backyard, Jay came indoors and made himself comfortable. He sprawled out on the sofa and appeared to be at ease. Sheila realized this could be a good time to leave. Somehow, in the forty-five minutes spent in her car, Jay grew very attached to her. Once she left, the pacing began. He could not lie still on the sofa. This poor dog was scared and did not understand what was going on. Sophie acting like a goof around the Jay-bird on day 1. She soon decided she was too cool for this. I fed him (some old Puppy Chow came with him, although I remedied that the next day with a free bag of Nutro Puppy, thanks to PetSmart’s coupon program). My dogs had already eaten, but there would have to be eating shifts: both Sophie and Rufus would try and sneak gulps of food from his bowl. The funny part was bedtime. Everyone had a trip outside before bunking down. I took Sophie and Rufus upstairs while Jay stayed downstairs in his crate, and of course, he cried. Rufus, took it upon himself to take care of Jay. These two completely got along as long as there was a crate separating them – there was lots of making out through the bars. So when Jay cried, Rufus headed down to the living room. The crying stopped. Rufus was a support dog? Stranger things have happened. I don’t know where Rufus slept that night. He was in my room when we had a two a.m. wake up call from Jay. I put Rufus in his crate and let the Jay-bird out. I don’t know that he needed a pee break as much as he needed to know he wasn’t abandoned. Then we all returned to sleep pretty easily. The next day required more shifts. Jay loved playing outside. He found most of Rufus’ toys and had a grand time playing fetch. He followed Sophie around, and she put up with him. We also walked around Central Park in Stapleton where he showed me how much he loved birds. He knew “sit” but had zero concept of “heel.” No worries for now: I just needed a tired dog. We visited my vet to introduce him and get him weighed: 60 pounds of lanky boy. The staff thought he was adorable and he showered everyone with love. Our night and next day were about the same: shifts of crate time and playing. I tried another play time with the boys and got the same result. Rufus could not play nicely. Since Sophie was over this whole circus, she stayed away and looked at me as like I was to blame for this whole fracas. She was not wrong. Rufus is not even two years old yet so he’s far from having it all figured out. He plays well at daycare, and that means everything. Nevertheless, his energy level is crazy right now, and when he gets wound up, he’s a tornado. He managed to damage his crate even more – when he wants to bust out of it, he can do it. I’m trying caribeaners to keep it closed, but who am I kidding? Those things won’t hold it. I’ll need a new crate. Overall I enjoyed fostering. A few issues with my dog caused some stress, but there were no fights or any destruction. Jay has moved onto his more “permanent” foster where he appears to be thriving. I can’t imagine this giant mush puppy having a hard time finding a forever home. I was happy to help out, and I can certainly do short spurts again. I may need to wait another year or so before fostering again. Rufus needs to mature more. UPDATE: Jay has found his forever home! His more permanent foster Michelle reports that while she misses him, she knows that he will be very happy and loved to the moon and back with his new people. Hooray for Jay! That’s awesome that you were able to help Jay out! I keep going back and forth about whether or not I want to start fostering again after we move into a bigger place. I love doing it, but I’m pretty notorious for being a failure at it. I get attached too quickly and end up with a new pet that I wasn’t really planning on. I absolutely LOVE these photos!!!! I tried fostering 3 kittens once, I of course failed horribly. I just couldn’t part with them!!!!! What a GORGEOUS dog! I feel bad that I am not in a place to foster any pets right now. Especially seeing this beauty come from Kansas – where I LIVE! I could have taken him in. Someday I will be able to do this but I surely love people like you who DO it! You obviously had a handle on what Jay needed as well as what your own dogs wanted/needed. It can be a difficult balancing act, but it sounds like you aced it. I hope you’ll continue to offer short term fostering. So glad he found a permanent home! He sounds like a sweetheart and your description of Rufus has me dying laughing. Beau is the same exact way. Good for you to take him for a little while and so glad that everyone got along. What an interesting experience. I’m happy to hear Jay has already been adopted. I admire people who foster. I loved reading this post! I’m glad that Jay has a forever home and thanks to you and his “permanent foster” for helping him when he needed it. Sophie sounds like she is very clever, I loved how you described her as the RA who just packed up and moved away for the night!